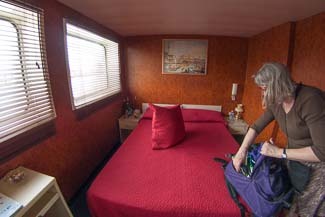 ABOVE: Cheryl unpacks in cabin no. 2, "Canaletto," on the lower deck of La Bella Vita. Staterooms. Eight staterooms are on the lower deck, with four on each side of a central corridor. Beds can be configured as queens or twins. Each cabin has two large windows with wooden Venetian blinds. The staterooms are compact (not unlike those on many river ships), but they have adequate storage space and plenty of room under the beds for suitcases and other gear. The small desk in each cabin has a retractable shelf for a laptop computer, and there are plenty of electrical outlets. Bathrooms are small but functional, with showers, sinks that are large enough for doing hand laundry, and vacuum toilets. Suites. La Bella Vita has two suites on the upper or main deck, in a quiet location aft of the dining room. The suites are slightly larger than staterooms on the lower deck and have bigger bathrooms, but their main extra feature is a pair of double doors that open onto a French balcony. Each stateroom or suite has a closet with a wardrobe drawer. A hairdryer, bathrobes, and slippers are provided.